Across all industries today, the next generation of intelligent technology solutions are evolving, and industry is increasingly dependent on the internet for growth. As Information Technologies and Operational Technologies (IT/OT) converge, the reach of the so-called Internet of Things (IoT) is moving further into physical environments where the demand is most needed (which can also be broadly defined as the “edge”). As a result, in a recent report ’Reinventing the Internet To Secure the Digital Economy’ Accenture estimates that by 2023, average targeted business growth that is dependent on the internet will double. In the energy sector, business growth is being supported by ever more sophisticated data analysis gathered from internet enabled machines. Data is being converted into actionable knowledge that can increase oil and gas asset utilization, reduce energy and costs. Sensors which monitor plant and field processes, products and workers; drones which inspect pipelines; robots which run manufacturing processes—all are internet enabled and where oil companies are exploiting the “edge” as a critical part of their operational infrastructure. 94% of oil companies rank business growth through internet-enabled initiatives in their top three strategic priorities. 74% of oil companies became largely dependent on the internet over the past 10 years. As the pace of adoption of new and emerging technologies quickens and business dependency on the internet grows, adequate safeguards against cybercriminals are vital. 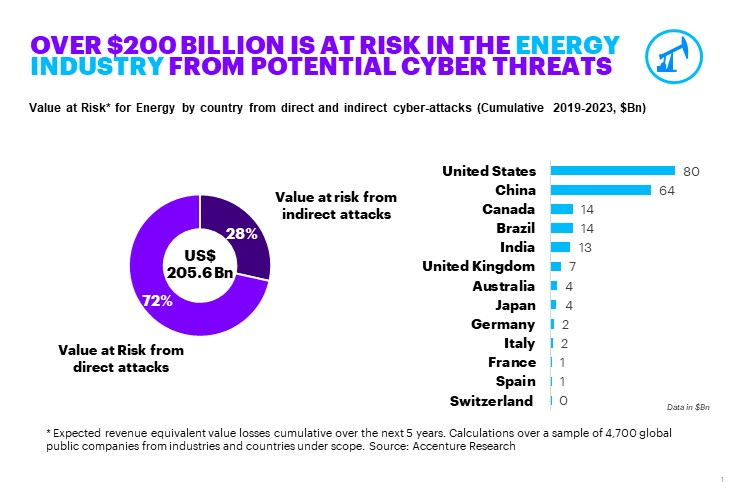 Accenture’s survey shows that 84 percent of oil companies believe that without a dramatic improvement to the security of the internet, the advancement of the internet economy will be severely hindered. Governance—joining forces with other companies and create collaborative relationships with peers, government representatives, regulators and industry association leads. This is area where the oil industry, with its long history of governmental and national incumbent relationships could excel. Business Architecture—embedding the idea of a trustworthy digital economy in the vision for their company’s business architecture; ensuring security is prioritized within company boundaries and its ecosystem. Embracing and developing technologies that can advance their businesses and enhance digital safety investments that improve Internet infrastructure and support further IT/OT convergence. This should include updates to the Internet’s basic protocols and networks as well as training for partners and employees against ransomware threats. In this way, oil company CEOs can drive a trust turnaround for the Internet and secure not only the growth of their company but also the future of the digital economy.